This ride takes us on an old road connecting the Arenal Dam with the main entrance to Arenal Volcano National Park.Â From there we go towards the village of El Castillo, biking on a quiet lane surrounded by dense forest and cattle farms. Along the ride we see howling monkeys, coatis, and birds like toucans, Egrets and king fishers. Well stop for a picnic on the shore of Lake Arenal where its possible to swim. The volcano is visible during all of the ride and we can usually hear its activity while we bike. Is an artificial reservoir located in Costa Rica formed after the construction of a dam in 1979 taking advantage of the existence of a small lake of the same name. 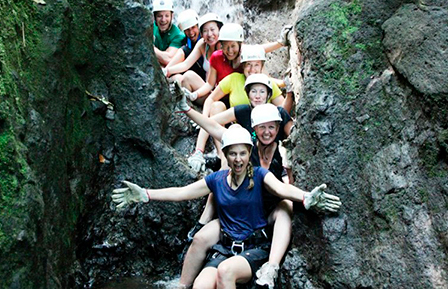 It is located near the Arenal Volcano and Monteverde Cloud Forest at coordinates 10.53, -84.93. The towns of Tilaran and La Fortuna, in the provinces of Guanacaste and Alajuela respectively, are the largest and most important nearby. On its surface, is the largest lake in the country. It is approximately 30 km long and about 5 km at its widest point, with an area of 85 square kilometers. Its depth varies between 30 and 60 meters, depending on the season. Lake Arenal is the key point in which an ambitious hydropower generation is based in Costa Rica and currently produces energy for most of the country. During construction, the communities of Arenal Viejo and Tronadora were completely flooded when the expansion of the lake was made. There are two main dominant fish species in the lake, crushed fish and sea bass. Among the most common birds in the lake are the hummingbird and the woodpecker.